Please refer to our stock # 17AX when inquiring. Heavily gold plated, Mazer has designed a very three dimensional piece of considerable elegance. 2 3/8" long, 1 7/8" wide. 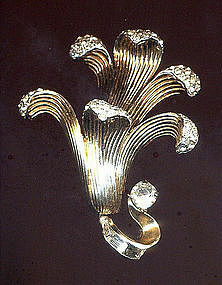 Very heavy brooch.